This 15-foot DisplayPort to DVI-D cable connects the DisplayPort output on your PC, laptop or Ultrabook to the DVI-D single-link input on your monitor, projector or television. No separate adapter or cable is needed. This allows you to continue using your existing DVI-D display for video without the expense of buying a new DisplayPort monitor. The P581-015 is ideal for the office, classrooms, lecture halls and anywhere else you may need to connect your DisplayPort source to a DVI monitor. It also allows you to conveniently connect an additional monitor to your home or office workspace. The DisplayPort to DVI-D cable with durable molded ends supports high-definition video resolutions up to 1920 x 1200 (including 1080p) at 60 Hz. Latches on the male DisplayPort plug and thumbscrews on the male DVI plug prevent the cable from being accidentally dislodged and interrupting vital video transmission. 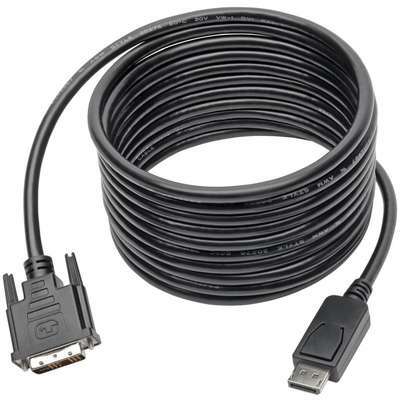 This cable is a passive adapter that requires the connected computer to support DisplayPort++ (DP++). This allows DVI signals to be passed through. Check the documentation for your DisplayPort source for compatibility. The plug-and-play DisplayPort to DVI-D converter requires no software, drivers or external power, works with both Windows and Mac operating systems, and is compatible with laptops and other devices equipped with a DisplayPort output that supports DP++. Its 15-foot length is helpful when an extended reach is needed, such as connecting to a projector. The P581-015 is backed by a 3-year warranty, ensuring reliability and performance.